I am so proud of myself for remembering to get a picture of my post-run oatmeal bowl. 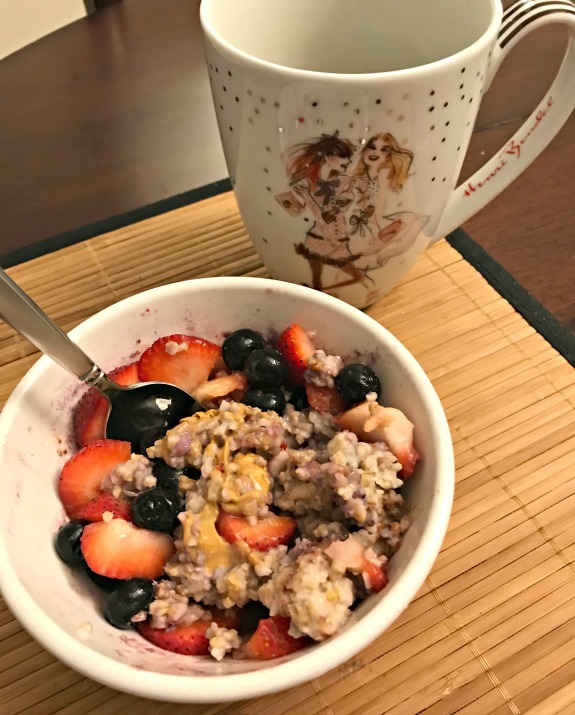 I’ve started adding raisins to my usual mix of oatmeal, frozen blueberries and strawberries. The jumbo black raisins from Trader Joe’s are my favorite! I am back to working at Panera a few mornings a week in order to really focus. This usually turns into me ordering my favorite (made-up-by-me) Panera salad for lunch. 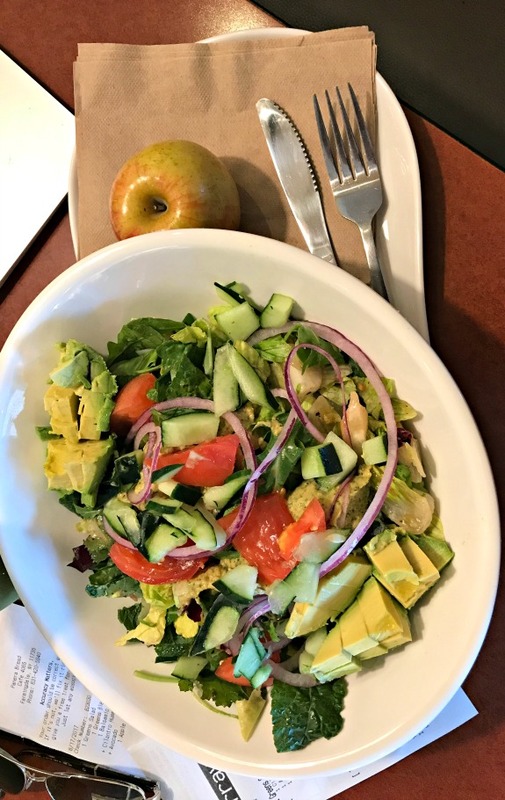 Is it me or did Panera get new bowls for the salads? The salad looks different, right? And that apple you see there is the only time I eat apples right now. You know I have completely given up my apple and peanut butter a day habit when I don’t even buy apples at the grocery store anymore. Maybe one day I will get back on track with my former favorite snack. I had a salad and pizza craving the other night so this really hit the spot. 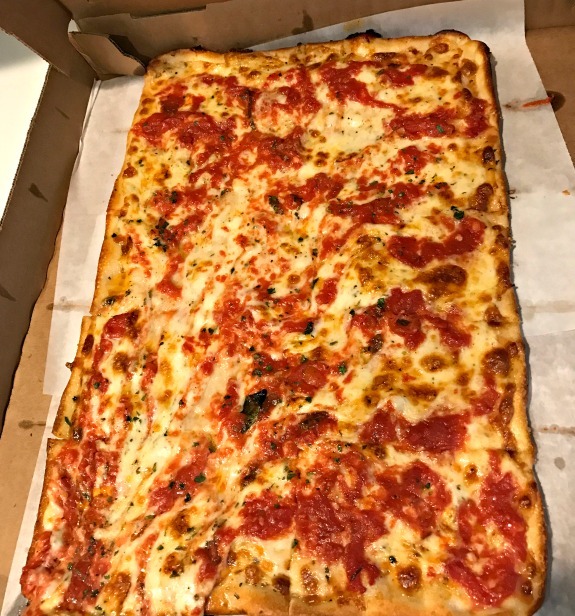 We chose a grandma pie and of course I went for the corner slices. I had this plate of salad and pizza X two. 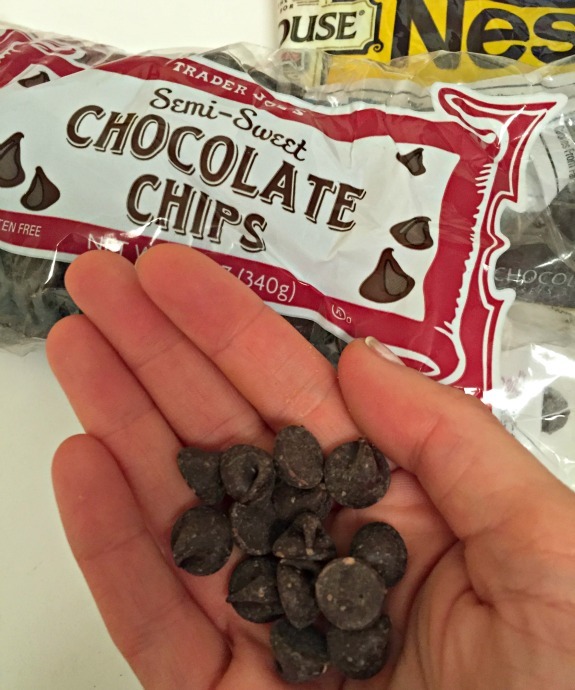 I am really simple lately, just hand me a bag of chocolate chips and I am happy. I have both the Nestle dark chocolate chips and Trader Joe’s semi sweet chocolate chips in the house. The chocolate chips from Trader Joe’s are still my favorite though. Not pictured is watermelon that I snack on throughout the day. I usually cut up two watermelons a week although I am guessing that will end soon as we approach fall. I don’t want summer to end! 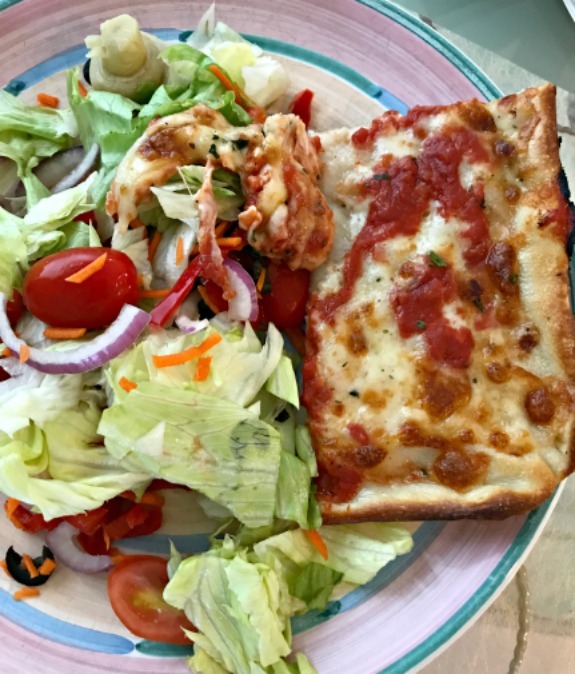 Any recent meal cravings (like salad and pizza) to report? I always like a corner piece as well! I’m not a raisin fan. I’ve been craving pumpkin pie! I haven’t been to Panera in a while but it totally looks like they got new bowls! They used to be green and more circular right? I only like raisins if they are covered in chocolate which I don’t eat a lot. Something about the texture isn’t my favorite. Breakfast today was a scrambled egg and smoothie. I love chocolate covered raisins! I didn’t used to like raisins but I do now! Just not those big soggy light brown ones in baked goods. Those are gross. Can you believe I still haven’t bought a watermelon this summer. I need to change that. I’ve been all about the peaches instead. I actually cannot believe that – hurry up before they are gone! I had oatmeal for breakfast today too!! I had my wisdom teeth removed yesterday so I can’t eat any solid food yet. I tried a pre-made one from Trader Joe’s and it was really good! ugh- I remember having all four of mine removed – not fun! hope you are feeling well soon! Those raisins sound yummy, I’ll have to check it out! I rarely eat pizza and it has sounded so yummy, so I had some bbq chicken pizza on Friday night and it was delish! I’ve also been craving peanut butter pretzels like a mad woman. I’m guessing it has something to do with running in the afternoon (and sweating like crazy!). Today’s breakfast was vanilla greek yogurt with blueberries, banana, and coconut chips. Corner pieces of pizza are the best! I like raisins a lot – if there’s an option, I’ll reach for oatmeal raisin cookies over any other type, and I can just eat raisins by the handful. I also like pizza probably too much – we’ve had it twice in the past 5 days, once delivery with homemade salads and then homemade last night with lots of vegetables. It’s just so good! Where I work from is totally dictated my my craving for that day. It’s like a mini-reward for doing actual work. LOL!